Yesterday, “They Told Me to Find a Rich Husband” got a Facebook page and a Twitter account. That’s right, loyal readers, your favorite social networks can help keep you abreast of my latest musings on the way we love and are expected to love now. I confess that I felt a little guilty as I created the “FindRichHusband” twitter account. I’ve scoffed at such forms of self-promotion in the past. But I realized that syndicating my blog through social networks is a lot like wearing a lacey black push-up bra under a white plunge-neck shirt when you go out on a Friday night. It’s not a style approach I necessarily consider “classy,” but let’s face it — a girl can’t make it in this world on her smarts and charm alone. Sometimes to catch people’s attention, she has to flash a little cleavage. Once someone has bought her a drink, her intellectual talents and penchant for witty exchanges keep him in her corner. Facebook and Twitter are my blog’s push-up bra: they’re a sneak-peak at the full-monty. They entice you in, and then I work it to put on a good show. At my family’s Labor Day bbq, my mother asked me what I hoped to gain by creating a facebook profile for They Told Me to Find a Rich Husband. “Aren’t you just sharing it with the people who are already reading it?” she asked. I tried to explain how “liking” something on facebook works, how News Feeds are like mini-ads, how the possibilities of expanded exposure were endless, but I don’t think I convinced her my internet lingerie was a worthwhile effort. To her, a facebook profile for a blog is the equivalent of wearing my black push-up bra and white shirt on a night in with my brother and first cousins — a whole lot of fuss for no action. Maybe. Yet in this wireless age where everyone is connected to somebody with real connections, no chance at being discovered should be overlooked. Then again, maybe I should be wary of all this internet pimping. “I worry that with all this attention you’ll end up having to kill the blog too soon to get a book deal,” a friend of mine said after liking They Told Me to Find a Rich Husband on facebook. He didn’t think I’d be on the dating market for too much longer. I chuckled and calmed his concerns. 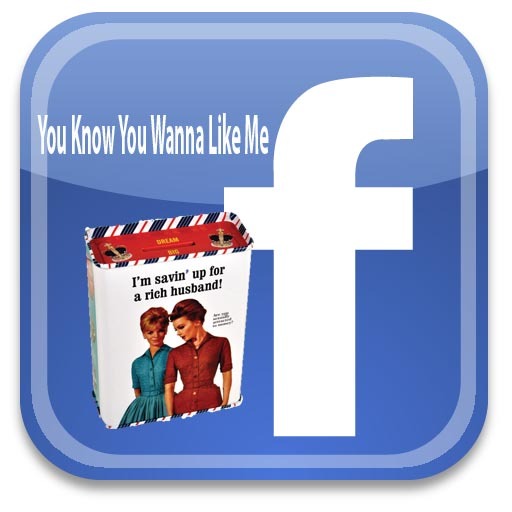 There’s nothing wrong with self promotion and where better than Facebook and Twitter. Also, I was thinking that you wouldn’t have to alter your blog/account names at all. They are already nice and adaptable, as far as tense goes. Watch: They Told Me to Find a Rich Husband and I’m looking. They Told Me to Find a Rich Husband and I did. Or – FindRichHusband (for me please). FindRichHusband (like I did). A lot of this works both ways – but it’s not just about direct relationships between people – it’s about the way we are with everybody. I guess broadly you can put everybody into two groups, can’t you – people who care and who take the time, and people who are self absorbed and thoughtless. hoping to read more of your stuff!